Experiments are centered on the investigation of two areas pertaining to photosynthesis: factors that affect the photosynthetic process; and cellular structures or substances involved in photosynthesis. Through experiments, students determine that carbon dioxide, light, and chlorophyll are three of the necessary components of photosynthesis. They also discover that during photosynthesis, plants produce oxygen and produce sugar, which is then quickly converted to starch. Through investigation, students observe that an Elodea plant in water and exposed to light performs photosynthesis. By using an oxygen meter, students can identify an increase in the amount of dissolved oxygen in the water containing the Elodea plant. This is a product of photosynthesis. Using the pH indicator phenol red, students will observe the change in pH of the water containing an Elodea plant. Students will correlate the observed change in pH to the use of carbon dioxide during photosynthesis. Students also investigate the properties and the importance of chlorophyll. Using paper chromatography, students find that the color in green plants consists of several chlorophyll pigments. Students explore the cellular structure of plant cells to observe chloroplasts in various parts of an Elodea plant. Students connect the role of chloroplasts to the process of photosynthesis. 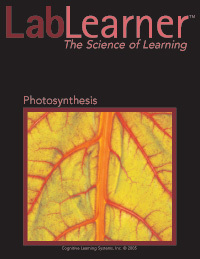 From these observations, students conclude that photosynthesis takes place in Elodea. Finally, students observe that most sugar production and some subsequent starch storage takes place in the parts of the plant which contain chlorophyll. Students find that in a variegated Coleus leaf, starch is stored in the green parts of the leaf more than in the white centers of the leaf. Through these investigations, students come to a more complete understanding of photosynthesis as a process that uses raw materials in the presence of light and chlorophyll to create products. Conduct experiments to investigate the reactants and products that are involved in photosynthesis. Use an oxygen meter to observe photosynthetic activity. Use phenol red as a pH indicator to observe the use of carbon dioxide during photosynthesis. Through experimentation, students conclude that light is necessary for photosynthesis. Observe chloroplasts and identify both the stem and the leaves of an Elodea plant as areas where photosynthesis occurs. Discover that photosynthesis occurs in the areas of a variegated Coleus plant which are green and does not occur in the areas of a variegated Coleus plant which are white. Students exhibit knowledge that photosynthesis produces sugar. Understand that sugar production leads to starch storage. Use the process of paper chromatography to separate the pigments in chlorophyll. Understand that chlorophyll contains multiple pigments of various colors including yellow and green.